In few small towns has a tiny Jewish community left a bigger mark than in Dumas and McGehee, Arkansas. Their stories are testament to the idea that even the smallest Jewish communities are important. Located in the cotton growing region of southeast Arkansas, Dumas and McGehee are about twenty miles apart. They are just two of several small towns in the area that have had Jewish communities. Dumas is located in the northeast corner of Desha County. The railroad first came through Dumas in 1879. In 1892, fewer than 100 people lived in the town. The town's first main industry was timber, but as loggers cleared more land, it became a major cotton growing center. With both timber and agriculture fueling its growth, Dumas attracted a commercial economy and a small Jewish community. Gus Waterman was the first Jew to settle in Dumas. He had come to the United States from Germany in 1866 at the age of seventeen. He first settled in Maine, but his peddling eventually took him to Memphis. He moved to Dumas in 1879 to open a store in a town that was little more than a wide place in the road. Waterman’s store was a speculative venture, and he worked to build Dumas into a commercial center. Waterman was one of the town’s earliest civic leaders. He served as postmaster from 1881 to 1887, and was elected as the town's first mayor when it was finally incorporated in 1904. He also worked to get levees built to protect Dumas from frequent river flooding. In addition to his store, Waterman owned a livery stable business and acquired a large amount of farm land. Waterman is known as the “father of Dumas” and a street bearing his name still exists in town today. Although there were no local Jewish organizations in the area, Waterman was committed to preserving his faith. Rather than intermarrying, he married a Jewish woman, Rachel Ulman of Memphis. Their son Julian became the founder and dean of the University of Arkansas Law School. Julian Waterman was widely respected across the state, and even turned down a nomination to the state supreme court, preferring the relatively non-political world of the law school. Julian’s brother Lawrence remained in Dumas, running the Waterman family business until his death in 1948. Charles Dante and his progeny made a lasting impact on Dumas throughout the twentieth century. Dante came to the United States alone at the age of twelve in 1890. He had a cousin in Pine Bluff, Arkansas who encouraged him to spend time in New York earning money and learning English before he took the train to Arkansas. In 1892, Dante finally made his way to Pine Bluff, where he got a job with William Rosenzweig’s mercantile company as a peddler and store clerk. To earn some extra money, Dante sold matches that he made from wood he had scavenged. He spent time as a wagon peddler in southeast Arkansas, where he noticed the growing economic opportunity in Dumas. ​After saving $500, Dante moved to Dumas to open a small store in 1897 when he was only twenty years old. In 1900, he married Antoinette Stiel of Little Rock and opened a larger store, which was eventually known as “The Globe Store.” When the store burned down in 1925, he rebuilt it bigger than ever, changing its name to “Dante’s Department Store.” Dante’s retail success led him into several other business ventures, especially cotton. He established a ginning company that lasted through the twentieth century, eventually run by his great-grandson. He also acquired thousands of acres of farmland in the area. Since Dumas had made him an economic success, Dante was committed to giving back to the community. His record of civic leadership and philanthropy is extraordinary. Dante served as president of the local school board, as well as head of the chamber of commerce. He was elected mayor in 1919, making him Dumas’ second Jewish mayor in the town’s short fifteen-year history. The Dante family donated land for a city park, a city pool, a new public school, and several local churches. Although he never went to college himself, Charles Dante was a strong believer in its importance and created a student loan program that enabled many Dumas citizens to attend college. Charles was named the outstanding citizen in Dumas in 1949 by the local Lion’s Club. Charles’ wife Antoinette was also active in civic life. She was a founder of the town’s first public library, raising money for the project by planting a small field of cotton and picking it herself. She was also active in the United Methodist Women’s Circle since there was not a Jewish congregation in the area at the time. Her participation in the church group reflects the strong interfaith culture in Dumas, as well as the acceptance Jews enjoyed from their non-Jewish neighbors. Their children continued the family tradition of civic involvement. When Hitler came to power in Germany, Charles Dante helped many Jews to escape Europe before the war broke out, including his nephew Harry Phillips, who came from Poland in 1938. Phillips worked for Dante’s Department Store before serving in World War II and being wounded during the Normandy Invasion. After the war, Phillips came back to Dumas and married Elsie Hamburger from McGehee. Dante’s daughter Naomi married B. J. Tanenbaum, and the couple moved to Dumas in 1932. Tanenbaum joined the family business, and later formed the DanTan clothing manufacturing company. Although they sold it in 1957, the company became the largest industrial employer in Dumas. That same year, Tanenbaum created the United Dollar Store, which soon grew into a successful regional chain. The first store was on the same site as Dante’s Department Store in downtown Dumas, from which it grew to 200 locations across the South. Tanenbaum’s son Jerry was a vital part of the company’s success, serving as chairman and CEO from 1961 to 1977, when they sold the chain to Dollar General. Multimedia: Ruth Frenkel was born in Bad Kissingen, Germany, and came with her family to the United States when she was a young child. In this excerpt from a 2013 oral history interview, Ruth talks about her family's escape from Nazi Germany and their new lives in southeast Arkansas. Though he lived much of his adult life in the small town of Dumas, Jerry Tanenbaum became a national leader of Reform Judaism. As the successful president of the United Dollar Store chain, Tanenbaum became very active in Jewish causes. He was the longtime chairman of the board of the Henry S. Jacobs Camp in Utica, Mississippi, which served Reform Jewish children from around the region. Tanenbaum also served on the boards of the Union of American Hebrew Congregations and the Hebrew Union College. He is currently active with the World Union of Progressive Judaism, which helps Jews around the world. His wife, Pat Tanenbaum, was also active in Jewish causes, especially in Latin America. Through her involvement with the Union of Jewish Congregations of Latin America, Pat helped Jewish communities throughout Central and South America. In 2010, the UJCLA established a foundation in Pat's memory that sends Jewish children in Latin America to youth camps and Israel. The Tanenbaum family cared deeply about the well being of Dumas, and did much to improve life there. They donated land for a new Dumas High School and the Desha County Museum. The city opened a new library in the 1950s during an era of segregation laws that prevented blacks from using it. The Tanenbaums gave the money for another library serving the town’s black community and purchased the same books that were in the white library. In 1994, the Tanenbauns dedicated a community theater in Dumas in the old Dante’s Department Store building. ​Another important Jewish family in Dumas was the Wolffs. 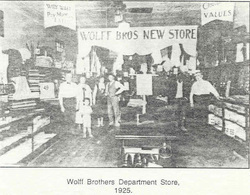 They came to town in 1911 and opened the Wolff Brothers Department Store. Sam Wolff ran the Dumas store; his brother Leo operated a branch in nearby McGehee. Sam’s son Haskell Wolff ran the store after World War II. Haskell served as president of the local chamber of commerce and spent three terms on the Dumas City Council. McGehee developed later than Dumas and, ironically, didn’t flourish until after the devastation of the great flood of 1927. In 1905, only about a dozen people lived in McGehee, though it began to grow once the railroad was built through town. After nearby Arkansas City was destroyed by the flood of 1927, many of its residents moved to the higher ground of McGehee. By 1930, approximately 3,500 people lived in McGehee, including about fifty Jews. Jews had enjoyed tremendous opportunities in Arkansas City, and many of the Jewish business owners there eventually moved their stores to McGehee. Abraham Dreidel owned a string of confectionery stories in the area with non-Jewish business partners. He was elected mayor of Arkansas City several times, serving from 1901 to 1905, and from 1910 to 1911. In 1907, he served in the state senate as the first Jewish senator in Arkansas. Although Jews usually started as retail merchants in the Arkansas Delta, they often got heavily involved in the local cotton trade. Sam Wolchansky started a dry goods business in Arkansas City, but moved to McGehee in 1906. Wolchansky acquired a lot of land in the area, and became a cotton grower and broker in addition to his dry goods business. He also built three cotton gins. Several McGehee Jews became leaders in the local business community. Bill and Adolph Hamburger sold livestock and horses before getting involved in the cotton business. Martin Dreyfus ran a large grain store in McGehee, and served as president of the local Lion’s Club. Charles Fleisig had previously owned stores in De Witt and Little Rock before he moved to McGehee in 1932. He opened the New York Bargain Store in McGehee, and ran it until his death in 1963. Dave Meyer came to McGehee to manage a store owned by William Rosenzweig of Pine Bluff, but soon opened his own store and became one of the most successful businessman in town. These are just a few of the Jewish-owned business in McGehee. After the 1927 flood, many farmers in the area were destitute and could not get loans from banks. Jewish merchants like Charles Dante, Sam Abowitz, the Hamburger Brothers, and Sam Wolchansky furnished hundreds of farmers with supplies to help them get back to work. Many credited these merchants with keeping the agricultural economy alive in the area. It took Jews in Dumas and McGehee several decades to establish community institutions. In 1927, they founded a local chapter of B’nai B’rith. While they had worshiped together informally for decades, in 1946, Jews from southeast Arkansas officially founded a congregation, which they named Meir Chayim, and built a synagogue in McGehee. Meir Chayim served the Jewish communities of McGehee, Dumas, and other small towns in southeast Arkansas. Though small, the congregation remains active today. Many of the Jewish-owned businesses in Dumas and McGehee have closed in the last several decades, as children have moved away to find greater economic and social opportunities in the big city. Although their numbers are dwindling, Jews have left an important legacy in this agricultural region of southeast Arkansas. Jews played a central role in the economic development of the region, and even as they became successful, remained committed to helping the larger community.